Designs by Lisa Somerville: Kitchen Sink Stamps - Tons of Fun! Kitchen Sink Stamps - Tons of Fun! Happy Kitchen Sink Stamps Monday! Thanks for stopping by today, I hope you had a great weekend! I spent the weekend helping DH paint, neither one of us like painting, but sure enjoy the nice clean walls! Have you popped by the KSS Forums or Gallery lately, there's a lot of fun ongoing challenges! 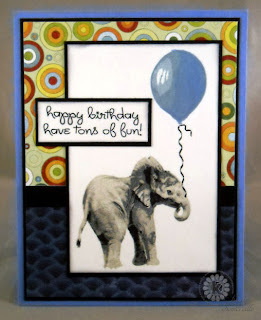 This week I dusted off the cute Multi Step 'Lil Elephant and paired him up with the Multi Step Bunch 'O Balloons for a CAS Birthday card. Well isn't that just too cute, a birthday balloon toting elephant! Adorable. What a fun card and matching bg paper too! How cool is that. Hehehehehe!! This is just too stinkin' cute, Lisa! Love the combo of sets!! Hugs! What a fun and fabulous birthday card, Lisa!! 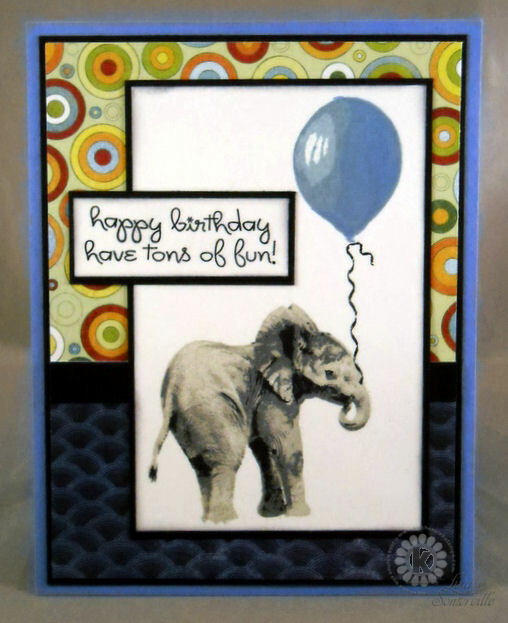 Perfect papers and great layout for this sweet elephant and his balloon!! Cute card! Love the elephant! Lisa, this is such a fun birthday card!! I love the use of both images! Wonderful layout and colors too! LOVE this card! How creative. BG is great...and I love how the elephant is holding that balloon! The sentiment is so fun! This card is perfect for anyone! Wonderful birthday card. I just love that elephant holding his balloon. He's so stinkin' cute that elephant! The papers are perfect with him. Great card Lisa!